Michelle Szabo & Shelley Koch eds. Food, Masculinities and Home: Interdisciplinary Perspectives. London: Bloomsbury, 2018. ISBN: 9781474262323. Food, Masculinities and Home is part of a Bloomsbury series on the home as a site where the social identities that structure political life are forged and negotiated. The home is a universal cultural category with relevance across many disciplines and lends itself well for an interdisciplinary approach to its study. 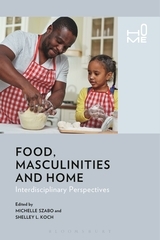 Food, Masculinities, and Home features articles by scholars from a range of disciplines including sociology, history, women’s studies, communication, cultural studies, agricultural studies, environmental studies, public health, and mathematics. While the domestic sphere has long been and continues to be associated with femininity, recent demographic, economic and cultural changes such as a rise in female labor force participation, gay households, single fathers, single men households and the blurring of the line between home and work, have brought more men into domestic spaces. In their introduction, the editors argue that we should investigate these movements for their transformative potential. Do these male domestic food practices challenge gender or other social hierarchies and inequalities? Do they change what it means to be a man? Is the notion of home being reshaped by an increased male presence and participation in the kitchen? And could greater involvement of men in domestic food production have positive consequences for public health and environmental sustainability? These are some key questions that motivate the volume. The introduction by editors Szabo and Koch is excellent and comprehensive, yet brief. The editors review current scholarship on the intersections of food, gender and culture and make a clear case for why the traditional conceptual division of spheres into female/private-male/public needs to be re-examined. Their introduction ends with an 8-page long treasure trove of a bibliography filled with up-to-date books and articles on food, culture and gender which can be fruitfully mined by students and faculty alike. The rest of the book consists of two sections of six chapters each. Most of the chapters are based on empirical research, but each section also includes one theoretical chapter. Section one is a collection of descriptions and interpretations of contemporary male food practices in domestic spheres. Section two is about representations of men’s cooking in media sources such as cookbooks, food TV and Hollywood movies. While the editors regret the fact that they were not able to solicit chapters on male domestic food production from African, Latin-American or developing Asian countries, the first section nonetheless offers a broad range of descriptions of domestic cooking by men of diverse national and ethnic backgrounds and ages. The contributors to this section also use a variety of research methods, ranging from the quantitative cluster analysis of a national time-use survey to the use of questionnaires and interviews to a highly original performative autoethnography by Marcos Moldes. This diversity means none of the chapters are alike and keeps the reader interested. With the exception of an analysis of a French cooking show, the chapters in the second section are predominantly about American media sources and masculinities. Yet this section, too, offers a variety of perspectives both empirical and theoretical and two contributors pay special attention to the role of food in construction of gender norms during childhood. While one of those, Fazakis, does mention blogs and YouTube as factors in the development of children’s culinary selves, this section lacks an explicit discussion of the influence of social media on the construction of new gendered food practices and culinary identities. As a whole then, the book offers the building blocks scholars need to begin constructing new representations of gender, home and food. Editors and authors offer a review of what went before, a wealth of empirical data from many parts of the world, several original theoretical concepts that allow for the conceptualization of new food-based domestic masculinities and a range of research methods that could be emulated by other scholars in this field. While any work on food and gender must grapple with gender inequality and build on the work of the many feminist writers who have examined the relations between the two, this work is not “preachy” or overly political. This can be a welcome respite for those of us teaching young adults, many of whom have not yet personally experienced the pressure of domestic obligations, do not problematize it and might be resistant to an outspoken feminist critique of men’s attempts at domestic cooking. At the same time, some might consider this lack of feminist boldness and political critique a weakness of the book, which does not explicitly discuss the ramifications of an unequal division of household labor for women, nor offer insights into what women might think about male contributions to the home kitchen. The contributors to the first section describe a variety of situations in which various types of men have become more involved in the home kitchen. However, most remain only cautiously optimistic, reminding the reader that truly revolutionary transformations in the household division of labor by gender are still lacking. Multiple authors cite data showing that well into the 21st century, women still perform the majority of the household cooking and continue to be expected to do so, that women’s cooking continues to be care work geared towards others which tends to remain unnoticed, invisible and unappreciated. In contrast, when men cook at home, it is more typically their choice to do so and for many men this thus remains an optional task, often more a matter of personal enjoyment and fulfillment than a social obligation. However, the chapters in this first section do begin to nuance these familiar distinctions between male and female cooking and offer insights into the circumstances under which certain groups of men increase their participation in the domestic food sphere, and how this, in turn shapes and changes masculine identities. To illustrate, one interesting finding that emerges from this section is that for certain groups of men, domestic cooking can be modified so that rather than threaten their masculinity, it can work to maintain or affirm it. This is the case for a group of Japanese men living in Australia who are the subject of a chapter by Hamada. Hamada shows that for these transnational men, opportunities for remunerated work in the public domain are reduced, which means they become relatively more empowered in the environment of the home. By adopting a casual, meat-filled style of Japanese domestic cooking they refer to as “men’s cooking” these men are able to reassert a part of their masculinity that was threatened by their diminished breadwinner role. At the same time, domestic cooking helps these Japanese men move closer to the ideal of Australian masculinity, which includes husbands who help out around the house. The chapter by Williams and Germov about a program providing food preparation skills for older men reaches a similar conclusion. When successful, programs such as these can improve the food choices and health of older men who never learned to cook but now need to due to divorce or the death or incapacitation of female partners. The authors show that the success of these programs depends at least in part on the extent to which men can come to accept cooking as a masculine thing to do. The authors found that when these men cook alongside clearly masculine men, sharing in a sense of male camaraderie, they are more likely to adopt cooking as part of their masculine identity and therefore more likely to cook meals for themselves at home. This is a significant finding that can have positive impact on the dietary health of single men when incorporated into the curriculum of cooking programs of this kind. For other groups of men, domestic cooking remains a feminine domain and something to stay away from, as is the case for Israeli men working in the female world of school teaching described in the chapter by Gvion and Patkin. The authors wondered whether men working in a female-dominated profession might have different attitudes towards home cooking than men employed in more traditionally male professions, but find that this turns out to not be the case and in the remainder of their chapter the authors describe these men’s interpretations and narratives of home cooking that exempts them, as men, from engaging in it. Similarly, 36% of the 728 Flemish men whose weeklong time-use survey data is the subject of a chapter by sociologists Daniels and Glorieux turn out to be “noncooks”. Despite this, in clustering the everyday cooking behaviors of the remaining men in this sample, the authors discover that depending on age, relationship status, family composition and employment status, some of these men do in fact cook for traditionally “feminine” reasons such as nurturance, commitment and obligation. The important role of food and cooking in modern fatherhood they describe resonates particularly well in the American context, where many families have been caught up in the demands of an intensive parenting style that requires an all-hands-on-deck approach to running a family. As my own dissertation research also revealed, American fathers in middle and upper-middle class strata have discovered foodwork simultaneously as a way to assist their overwhelmed wives, to build the intense connection between parent and child that is central to this parenting style, and also as a tool for instructional interactions with children about topics such as health, science and politics. Sobal’s theoretical contribution to this section, too, helps the reader conceptualize new cultural possibilities for men’s cooking at home. He uses social representation theory (Moscovini 1988, 2001) to expand Connell’s (1995) concept of multiple masculinities. Whereas Connell’s model recognized only hegemonic and subordinate masculinities, social representation theory allows for more radical ways in which men can “do” gender. This is a useful addition to a volume which seeks to elicit the changing relations of men to the domestic kitchen, because scholars will need theoretical models that allow for this conceptually. One could make the case that this chapter might have been better placed at the start of the book in order to serve as a common frame of reference for the more empirical chapters that follow. Moldes, a queer, second-generation Uruguayan immigrant raised in Canada offers a deeply personal account of male domestic cooking. In his chapter, he describes how he decided to learn to cook traditional Uruguayan dishes in an attempt to foster a sense of belonging in the female-controlled Latin kitchen of his childhood, to which he always felt an outsider, being both male as well as second-generation. He then walks the reader through these culinary experiments. By this “performative cooking” of challenging traditional Uruguayan dishes, Moldes remakes both the kitchen as well as the recipes as his own and in his chapter documents the process of this growing sense of belonging. His contribution is a visceral account of the way gendered identities are constructed in practice and adds a much-needed queer perspective to the existing literature on food and gender. In section two, the chapters by Fakazis and Christensen each examine media influences on the construction of gender norms in children. These are important contributions because understanding how the gender norms of the next generation come into existence is essential for our conceptualization of possible future gendered reconfigurations of the domestic kitchen as a more equitable domain. Fakazis takes a critical look at the relatively new foodie discourse marketed to children via resources such as children’s cooking toys, food TV shows and child celebrity chefs, among other things. She notes that these representations of cooking seem more gender-neutral today than in the past, presenting both boys and girls with viable role models for both professional, as well as caring, community-minded home cooks. The question does remain to what extent today’s children will be able to continue to follow those gender-neutral scripts as they grow up and face the structural conditions that shape the lived experience of gender. Christensen’s chapter stands in great contrast by offering a historical analysis of the 19th century American coming of age novels by Alcott and Coolidge to reveal how masculinity was shaped by expectations surrounding the eating of domestic food. She traces how in these books male characters were shaped into the types of restrained, disciplined, hardworking men with healthy appetites that their female readers should seek to marry and care for as future wives and mothers. The chapters by Leer and by Rodney, Johnston and Chong describe the ultimately still limited range of contemporary male gender norms presented by male celebrity chefs targeting male domestic cooks. Leer analyzes an episode of a French cooking show in which working class men are ridiculed for not knowing how to cook and for failing to help their wives at home. On the show, they receive cooking lessons from France’s most famous celebrity chef in order to turn them into better men. Taking an intersectional approach, Leer describes how this culinary instruction simultaneously constitutes a gender project, by which these traditional men are turned into more modern masculine subjects, as well as a class project, because it is typically more highly educated men in higher socio-economic positions who are comfortable with domestic work. In this way, the show thus not only highlights and affirms inequalities between men and women, but also between different groups of men. While the participants in this episode are explicitly taught to become more domestic, expressing an existing French, upper class new gender norm, it is important to realize that these men are being taught by a celebrity chef and not a housewife, which gives the cooking they learn during this episode the legitimacy feminine domestic foodwork still lacks. In this sense, this chapter is akin to that by Rodney, Johnston and Chong, whose discourse analysis of cookbooks by celebrity chefs yields four archetypical male cook personas, all based on culinary professionals and not on domestic cooks. The conclusion from these chapters is that for men interested in cooking at home, the range of role models are rooted in a traditional division of labor in which male chefs bring professional expertise, and that inspiring role models for working class, domestic, nurturing men are largely lacking from these media discourses. Parasecoli’s chapter about Hollywood comedies such as Daddy Day Care, in which men are unexpectedly required to perform childcare tasks typically carried out by women reaches a similar conclusion. In this entertaining chapter, he provides a careful, detailed analysis of the familiar scenes that poke fun at the protagonists as they stumble through unfamiliar womanly tasks and explains how these mainstream representations of masculinity thus wind up affirming and perpetuating traditional gender norms rather than providing new role models of domestic men. In the end, this section too, gives rise to only very cautious optimism about the emergence of possible new domestic masculinities and their meaningful contribution to a more equitable household division of labor by gender or greater equality among different groups of men. The final more theoretical chapter by Cox emphasizes this conclusion and warns the reader to not fall into the trap of taking the many media representations of cooking men at face value. Though the abundance of these representations may make it seem as if gender inequality around food and cooking is a thing of the past, it in fact persists stubbornly in many home kitchens where it has significant ramifications for women’s lives, their professional development and with that their social power and independence. Cox also cautions that even though new masculinities might indeed be emerging in the realm of food and cooking, this does not mean that old masculinities and gender relations are necessarily being replaced or made obsolete. There is still a lot of work that remains to be done. Connell, Raewyn. 1995. Masculinities. Berkeley, CA: University of California Press. Moscovini, Serge. 1988. “Notes Toward a Description of Social Representations.” European Journal of Social Psychology 18: 211-250. Moscovini, Serge. 2001. Social Representations: Explorations in Social Psychology. Cambridge, UK: Polity Press.